Walberton Players can trace their roots back to 1977, when it was decided that Walberton should stage a musical event to celebrate the Queen’s Silver Jubilee. Since then, the Society has presented regular musicals and plays, together with a generous sprinkling of concerts and other entertainments. We also have a junior section, Walberton Players’ Youth Theatre, whose members are children from Walberton and the local area. They have put on a number of highly successful and enjoyable shows. Walberton Players is a very sociable group, meeting on a Thursday evening at Walberton Village Hall. We are very lucky to be able to use the stage and backstage rooms for all the productions. 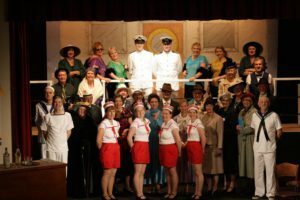 If you would like to become involved in any way, either on stage, or behind the scenes, then please do contact us via the website www.walbertonplayers.org. We would love to hear from you!